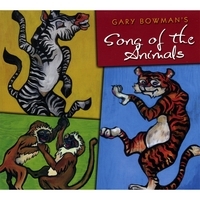 "Gary Bowman's Song of the Animals" is an inspiring collection of original songs celebrating the animal kingdom, set to Classic Rock, Pop, Bluegrass, Folk, Reggae and Gospel, influenced by the words and writings of Gandhi, Chief Seattle, John Muir and Moses, and the lyricism of poets Bill Martin, Jr. and Robert Frost. 'Song of the Universe' is a collection of original songs celebrating our amazing universe, inspired by generations of sci-fi writers, including H.G. Wells, Jules Verne, C.S. Lewis and Ray Bradbury. From Enceladus to Pluto, creatures are rockin' and reelin' to the house band on Olympus Mons --- and, you will be, too! An outrageous and inspiring collection of original songs celebrating the ocean world, set to an eclectic musical mix of Surf-Rock, Folk, Blues, Bluegrass, Swing, Reggae and Gospel, influenced by the words and writings of Rachel Carson, Jacques Cousteau, Ernest Hemingway, Henry David Thoreau and King David. A must-have for the entire family!